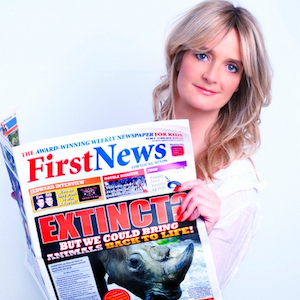 Nicky Cox is editor in chief of First News, the UK’s number one publication for children with more than two million readers a week. Nearly half of schools nationwide subscribe to First News. Nicky is also CEO of Fresh Start Media, a production company making broadcast films for, and about, children around the world. Nicky was made an MBE for services to children in the Queen’s Birthday Honours 2009, and in 2013, was given a Patron’s award from the NSPCC and ChildLine for dedication to children. She is passionate about giving kids a voice and a fair deal. In 2014 Nicky was one of the Women of Achievement in the Women of the Year Awards. She is often called upon to be a judge herself and has been on the panels for BAFTA, the Global Teacher Prize and the Mum of the Year Awards, as well as being a trustee of British Plaque Trust. She is also a special adviser to UNICEF and patron of the British Citizen Youth Awards.